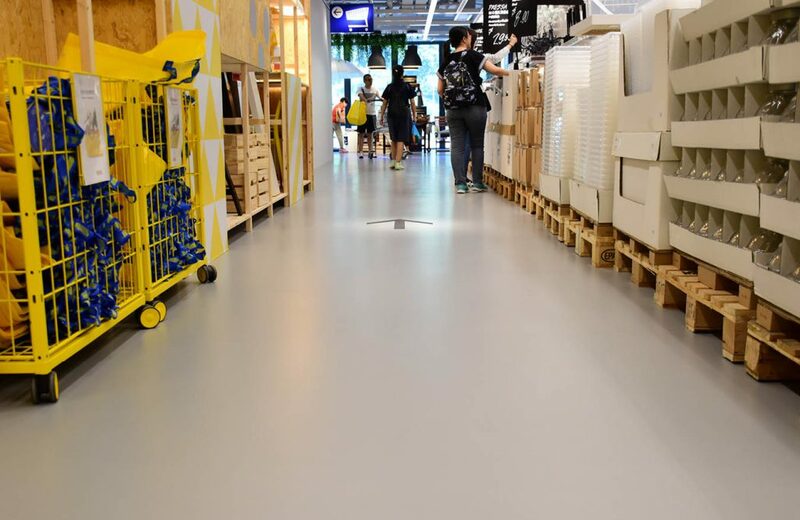 Hong Kong’s lovers of cost effective, flat-packed Swedish furniture will be able to browse the latest IKEA outlet with a robust, on-brand floor underfoot. IKEA’s fourth store in Hong Kong is in the Tsuen Wan area of the city, located in the CWD Building’s 8 ½ shopping mall. It offers customers not only a spacious showroom displaying furniture and home furnishings but also a children’s playroom and food court. 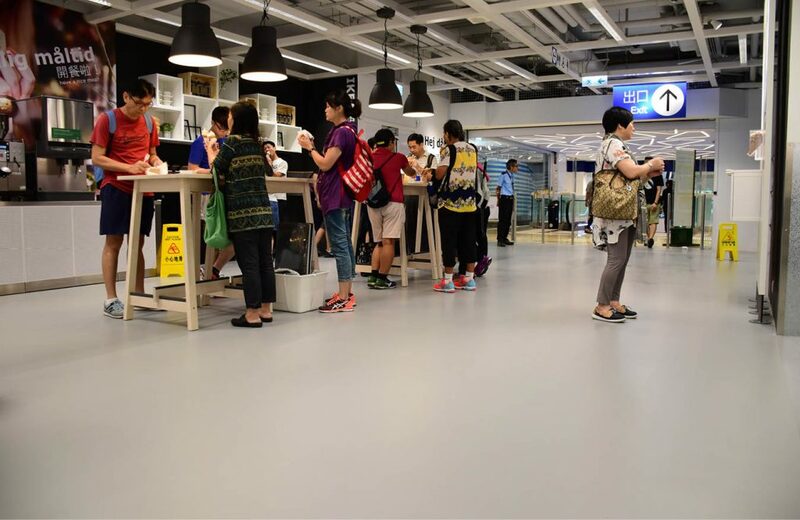 The floor in IKEA’s new Hong Kong store would need to withstand challenges such as heavy foot traffic and point loading. The iconic furniture retailer knew that it needed a build-up for the 4,000 m2 floor area that would facilitate a functional and safe site for both staff and customers while creating an overall look and atmosphere that reflected IKEA’s global brand and the high standards to which it is held. In order to achieve the desired outcome, a combination of flooring materials was required to ensure that the final surface would be up to the task at hand. The project began by applying a rapid-curing screed system. The chosen system is semi-dry cementitious screed that incorporates proprietary additives to produce an early drying, high strength screed layer. The screed was then coated with a seamless epoxy system and a UV resistant matt sealer. The self-smoothing epoxy system created a decorative, hard wearing finish, ideal for environments that require a level, easy to clean surface. 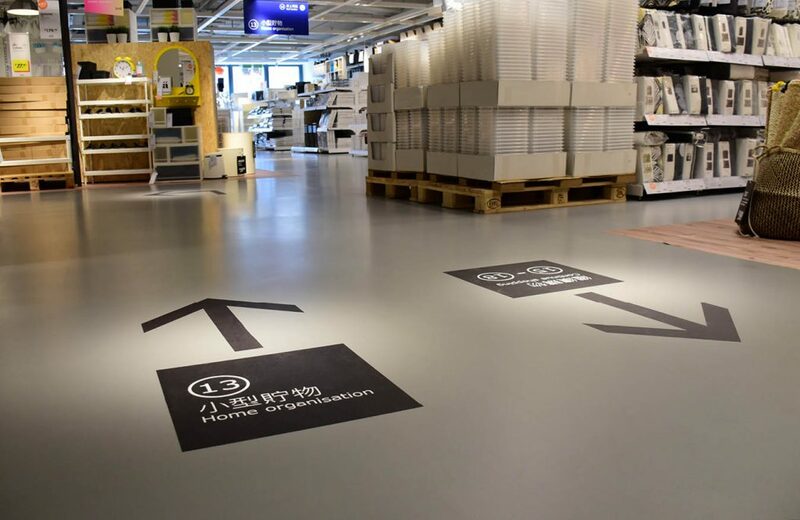 The floor finish was chosen in a sleek, light grey colour as it complemented IKEA’s globally recognised image and interior design scheme and it contrasted effectively with the black signage on the floor to aid customer’s navigation around the store. The signage on the floor had to be able to clearly stand out against the floor finish. The seamless, impervious and level nature of the floor means that the store’s cleaning regime can quickly and easily wash away any dirt or contaminants, keeping the store looking fresh and unblemished. 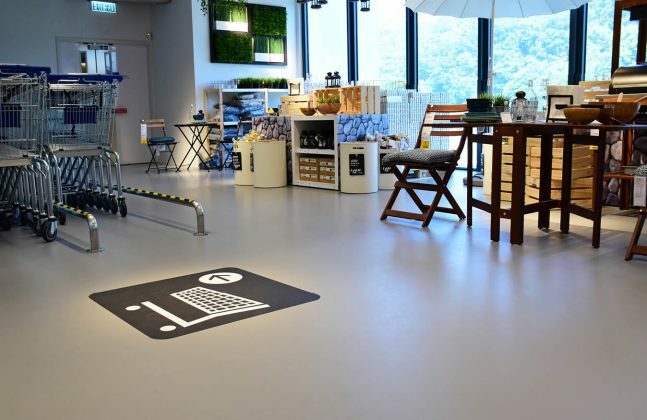 While often overlooked, the floor plays a crucial role in the design of large-scale retail environments, as it is the largest surface in the site and it provides the back drop on which the products are displayed. This means that if it is unsightly, unclean or unattractive it will quickly put off customers and will have a negative impact on the store’s profitability. This three-part flooring specification meant that IKEA could rest assured that the finish underfoot would maintain an attractive and effective surface for an extended period of time despite heavy foot traffic, impacts from dropped items, frequent cleaning, wheeled equipment, point loading from displays, spillages of Swedish meatballs as well as the unavoidable scratches and scrapes from moving furniture. In the restaurant area of the new store, the floor would have to facilitate a hygienic, food safe environment. 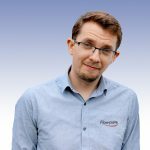 Daniel Ash is the PR & Media Manager at the global resin flooring manufacturer Flowcrete Group Ltd. Dan's role includes creating press releases, blogs, white papers and case studies on Flowcrete products and projects as well as educational content for construction industry professionals.